Co-skipper Arnaud Psarofaghis and his Swiss crew put on a second-day masterclass in tricky, light winds after two days of action in Qingdao, China’s Olympic Sailing City. Alinghi, who boast two Extreme Sailing Series titles from wins in 2008 and 2014, started slowly finishing fifth in the first race of the day, held in five to seven knots of breeze. But by the close of play they had notched up three podium finishes including two wins from the five tight races held on Qingdao’s stadium course. The impressive results put the team in first place but Series newcomers Sail Portugal are snapping at their heels in second after registering three second place finishes today. The two crews actually share the same points tally at the halfway mark, but a bullet in the last race of the day for Alinghi, the team competing in its sixth Extreme Sailing Series, hands it the overnight lead. “We’re really happy with today,” said helmsman Arnaud Psarofaghis. “We started slowly but it ended up well for us. We tried to stay clear of the other boats and just concentrate on keeping our speed up. It paid off. The eight crews faced a light, flaky breeze blowing through Fushan Bay that created a patchy race course and resulted in numerous lead changes over the five races. Consistency was key to success and Sail Portugal, competing on the Extreme Sailing Series for the first time, showed just what they’re capable of in light airs. Diogo Cayolla’s crew followed up their second place finish in yesterday’s only race with three more seconds, making them serious contenders at only their second outing on the global Stadium Racing tour. “It was a very, very good day for us,” former Olympic sailor Cayolla said. “It was very tricky conditions – we had some good starts and some very bad starts but we managed to find where the wind was. Former Alinghi skipper Morgan Larson goes into day three in third place with his Oman Air crew, two points ahead of Roman Hagara’s Red Bull Sailing Team which in turn lead Land Rover BAR Academy, Team Turx and SAP Extreme Sailing Team. A tough day on the water for Chinese crew One, skippered by US Virgin Islander Taylor Canfield, saw them come ashore in a disappointing eighth place. For them, one race started strongly finishing third in the first race but they got caught out by Qingdao’s fickle breeze several times. Their frustration culminated in being denied any points in the fourth race of the day for sailing outside of the permitted racing area. With two days of racing left, however, there is still plenty of time for any one of the eight teams to stake their claim to a spot on the podium. Racing resumes tomorrow at 1400 local time (0600 GMT). 1st Alinghi (SUI) Arnaud Psarofaghis, Nicolas Charbonnier, Timothé Lapauw, Nils Frei, Yves Detrey 61 points. 2nd Sail Portugal (POR) Diogo Cayolla, Bernardo Freitas, Javier de la Plaza, Luís Brito, João Matos Rosa 61 points. 3rd Oman Air (OMA) Morgan Larson, Pete Greenhalgh, James Wierzbowski, Ed Smyth, Nasser Al Mashari 53 points. 4th Red Bull Sailing Team (AUT) Roman Hagara, Hans Peter Steinacher, Stewart Dodson, Adam Piggott, Brad Farrand 51 points. 5th Land Rover BAR Academy (GBR) Bleddyn Môn, Leigh McMillan, Michael Barnes, Adam Kay, Neil Hunter 49 points. 6th Team Turx (TUR) Stevie Morrison, Tom Dawson, Tom Buggy, Martin Evans, Brad Funk 48 points. 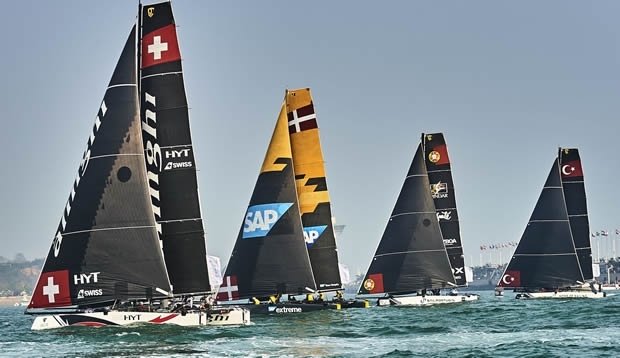 7th SAP Extreme Sailing Team (DEN) Jes Gram-Hansen, Rasmus Køstner, Mads Emil Stephensen, Pierluigi De Felice, Renato Conde 42 points. 8th One (CHN) Taylor Canfield, Chris Steele, Shane Diviney, Hayden Goodrick, Luke Payne, Liu Xue 38 points.